We were here! Even on that rock. Day 1: Potholes In The Air ! On the 18th of July, 2015, at the Chatrapati Shivaji International Airport’s Domestic terminal in Mumbai, the most happy and excited soul was probably mine. I was enjoying it all; collecting the boarding pass, security checks, and specially the boarding. When the plane left the ground; I could see the jam packed roads, the bandra-worli sea link, the birds sitting in warm sunlight probably mocking us humans – “Did you just pay to fly?” High up in the air, while passing through the clouds, the plane jerked due turbulence; as though there were potholes in the air! Some friends would come from Pune and some were Delhiites. We all were to meet at Delhi and then take a train which would reached Haridwar at around 7 o’clock. Day 2: Highway Number Athhaavan. After airways and railways, today was the time to get into the raw zones of Uttarakhand by road before we get down and start on feet. We all boarded a Tempo Traveller which took us to a place called Govindghat via NH-58. Govindghat is located at an approximate altitude of 6000 feet in the Chamoli district, 22 kilometers away from Joshimath. On the way we got down to see Devprayag which is a confluence of River Alaknanda and River Bhagirathi. We could clearly see two different coloured streams coming together and forming up a broader stream after the union. The NH-58 is a very challenging route full of obstructions due to landslides. It normally takes around 10 hours to cover those three hundred kilometers full of stoppages and critical road bends. Our journey through the NH-58 took more than 14 hours due to a major landslide which took around 3-4 hours to clear. 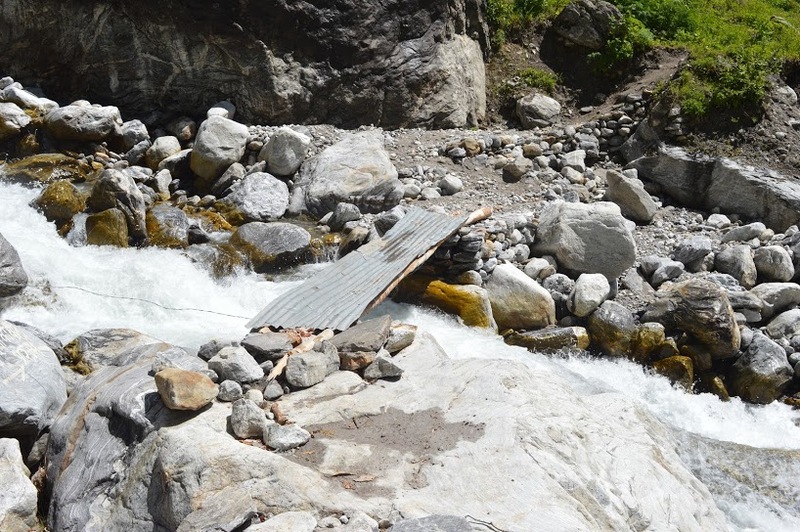 For safety reasons, vehicles are not allowed to go beyond Joshimath after eight in the evening. 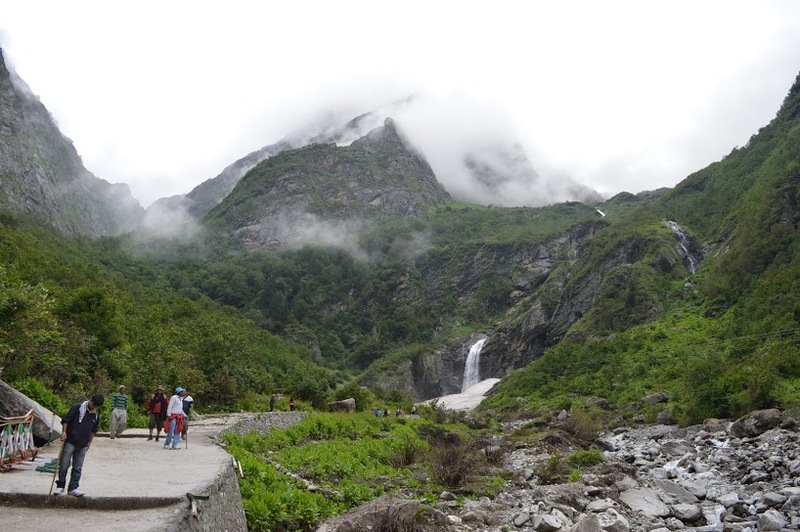 This would mean that if we get stuck at Joshimath; we had to find a hotel and spend the night there and travel to Govindghat which in the morning; which also meant that our trek start time from Govindghat to Ghangaria will be delayed. But nothing of that happened; we reached Govindghat at around 8.30 pm after cajoling the police guard who had stopped us near Joshimath. After a day long journey on extremely crude roads that kept us swinging continuously in the tempo, we had hot and delicious Gobi Ki Sabji and Paratha to end the day on a high. Don't look at us; look at the traffic! Day 3: Ganpati Bappa Morya. Chalo Ghangaria. Govindghat is a beautiful place; serene and cool. We were all geared up to start the trek to reach Ghangaria which is at a massive 10000 feet above sea level; this meant that we would gain almost 4000 feet as we trek towards Ghangaria. The 11 kilometers trek was filled with silence; the only noise was that of mother nature and us. We relaxed on the banks of River Lakshman Ganga. The ambience there was so refreshing and energetic that it was tough to leave that place. As a non-trekker, one good thing for me about this day’s trek was that it was not completely uphill; it was mixed with surprise flat and downhill patches too. We also ate fresh green apples on the way. We reached by evening. After freshening up, our guide told us that 200 meters inside Ghangaria, there is a glacier. We walked over to discover that there is also a huge waterfall amidst huge mountains on both sides and green patches on ground. The aura around was so amazing that a few of us decided to sit down and meditate near that place. We ended up having a lot of fun. There are no mobile networks in Ghangaria; there are these good old STD phones that allowed us to communicate our whereabouts and well beings to our families back in the cities. We would normally talk at nights after dinner. We could see breath vapours as we talked. We were away from any internet, TV or mobile connections. It was just us and the Nature – rendezvous. Ghangaria: That is the waterfall and the glacier which I mentioned earlier. Day 4: The Valley Of Flowers – Level 1. With persistent body aches, it was hard to get up early and get ready but as the day started kicking, we started rolling; after a heavy breakfast of Kulcha Sabji and a hot serving of chai. After packing our lunch packets that we would eat in the valley, it was time to get started and cover at least 4 kilometers into the valley today, so that tomorrow we can get past the 4 kilometers and reach 7 - 8 kilometers inside the valley till we reach the banks of River Pushpawati. Getting to the valley is a couple of hour’s trek. The Valley of flowers is a treat to the eyes with beautiful and colourful flowers all over. Due to fog, we missed many flowers but we had one more day in the valley. On the way, there were many river crossings. When you see an eye full of flowers, it looked as though a blanket of flowers is covered on the valley to protect it from the cold weather outside. The Valley is covered in snow all the time except from the months of June to September. After covering about 4 kilometres into the valley, it was time to come back. We hoped that tomorrow, it would be less foggy. My favourite from the valley. Day 5: Take 1 - The Valley Of Flowers – Level 2 ? While doing breakfast, it started raining. We thought our day would be wasted but after some time, rain stopped but it was all foggy. So, we decided to go to Hemkund Sahib today and postpone The Valley to the next day. Day 5: Take 2 - Jo Bole So Nihal, Sat Sri Akaal ! This holy Gurudwara is situated at an enormous 15000 feet. The 7 kilometers trek from Ghangaria has an altitude gain of almost 5000 feet, so the trek is very steep and tiring compared to The Valley. When I reached till the Gurudwara, I was extremely exhausted. On the way, we crossed glaciers and saw some splendid landscapes with huge mountains all around. Even after trekking to such humongous heights, there were still some peaks which oversaw us; I was awe-inspired by the size of those mountains. We reached to the Gurudwara at about 1.30 pm. Hemkund literally means a pond of snow. We took a dip in ice cold water and we were all shivers till we got hot water and food at the langar. We left back to Ghangaria at around 2.15 pm because it would soon get darker and foggy and staying overnight at Hemkund was not allowed. 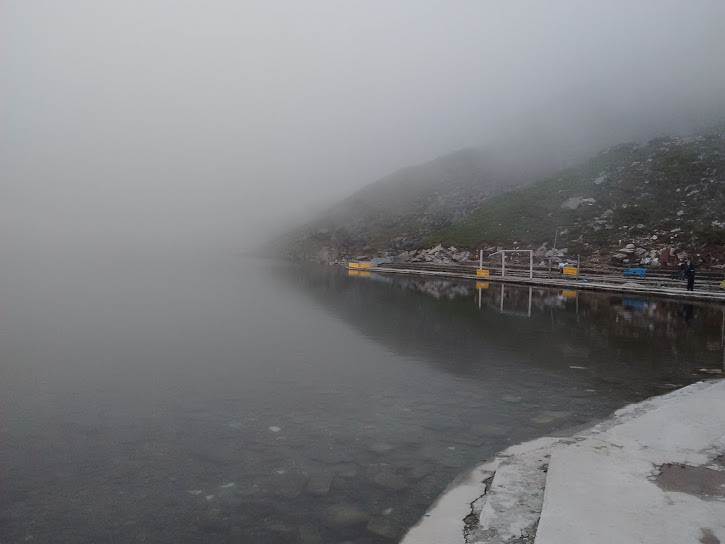 The pond at Hemkund Sahib. So clear! Seconds ago when we were in it, there was no fog at all! Day 6: Valley Na Milega Dobara. This day we were all hopes that the fog shouldn’t ruin the day. I was extremely fatigued and deep down my mind; I was okay even if the fog played foul. But the weather was extremely happy that day and we marched past the 4 kilometers that we trekked earlier. At the end of it all there was River Pushpawati and its serenity waiting for us. I closed my eyes and relaxed on the banks; all I could hear was the water gushing with supreme power through the valley. Technically this was the start of the return journey but there were many things-to-do pending, so we didn’t realize the homecoming had started. We had to go back those 11 kilometers to reach Govindghat. We started earlier because we had to visit Badrinath, Mana village and Pandukeshwar in the later part of the day. Mana is the last Indian village on the Indo Tibetian border. On the way, there is a legend which is known as Bhim Pul. After defeating Kauravas, Pandavas handed over the kingdom of Hastinapur to their grandson - Parikshit and came here for a heavenly abode. On their way to heaven, they came across the fierce River Saraswati which was impossible to cross. It is believed that Bhim lifted a gigantic rock and placed over the river, so that the Pandavas could cross the river easily. River Sarawati has a mystical start. It starts from between the mountains at the Indo-Tibetian Border. You can see the video below to watch the spotless flow of the River; the flow is so bursting with purity that it feels like it is milk flowing out. The River Saraswati is known as Gupt Sarawati because it goes on to merge with River Alaknanda at Keshav Prayag at Mana itself but the stream disappears somewhere suddenly; it doesn’t grow like the one at Devprayag which we saw earlier. While returning back, there is a place called Hanuman Chatti. Then we went to one of the Char Dham; Badrinath – very colourful – Jai Badri Vishal! We also got down to visit the Lakshman Jhula which is built over the River Ganga at Rishikesh. On the way, we could also the see what the 2013 floods had done to the surroundings. I was all goosebumps when I saw the water level at which the water flowed during the floods; the difference between the level now and then is disturbingly huge. Back at Govindghat, there is place called Pandukeshwar where Bhim built two monolithic temples overnight; one temple of his father Pandu and another temple of Lord Vishnu which is called the Yoga Badri. Yoga Badri is the winter residence of the Badrinath idol because the main Badrinath temple remains closed during winters. Day 8: Har Har Gangé ! It was time leave Govindghat and lead back to the noise and pollution back home. We would miss the mighty-forever mountains, the fear-no-one rivers and purest dose of oxygen to breathe. 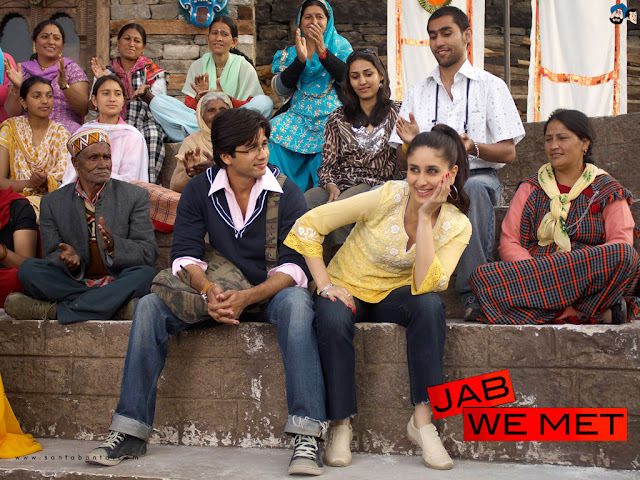 It was time to head back 300 kilometers of the rocky, landslidy and swinging journey to Haridwar. We started at around 7.00 am and reached at around 6.00 pm, booked a hotel, kept our bags at a hotel and rushed towards the Ganga for the evening Har Ki Paudi Ganga Aarti. But unfortunately we were late and missed the aarti. There were thousands of devotees seeking the blessings of the Ganga. We were back to people, pollution and pandemonium. We went back to the hotel, had lunch and boarded our 10.00 pm train which would reach Delhi next morning. From there, on Day 9, we would be boarding a flight back to Mumbai. The amount of happiness that the trip has given is not translatable into words. I would like to thank each of my friends; Akash, Amit, Anuja, Arup, Harpreet, Mamta and Sneha for conceptualizing and executing this trip so that we could witness and appreciate the better part of the nature. All the splendid pictures above are shot by my friend, Akash Khot. Akash blogs at skyposts.blogspot.in He is covering The Valley in a more detailed part by part series in marathi. Click here to check them out.